Read a one-year progress report that includes before/after photos of my natural forehead smoothing practices here. I’ve been practicing this routine for about 2 months and have seen results, which keeps me going. This is a long-term effort, it may take six months to one year to see significant results. For me, this little practice has further validated the effectiveness of skin remodeling for rejuvenation. It feels shallow to write an entire article on smoothing the forehead! What can I say, skincare is a relaxing, fun, and beneficial hobby for me. Here is my shallow little story. My entire life I’ve worn bangs, thick, wispy, short, and long. One brief time in my early 20’s I tried to grow them out and could not face so much of my face. Abort. I never tried again. Until now. At 59, it feels like a bad time to ditch bangs. Bangs curtain my worried concentrating brow which is fast becoming a deeply wrinkled brow and for no good reason! With bangs, I didn’t notice my constant forehead angst. Once I began pinning the bangs to the side of my face my constant forehead expressions became only too evident to me. Yes, my forehead muscles respond to life as if I am in a constant state of fear and/or deep concentration, alternately lifting or furrowing my brows, all the while keeping the muscles in constant flex. I had to do something or I would never survive the bang grow out. Know what I mean? This is easier said than done. If fact, it feels impossible. I am using mindfulness to try to change habits. How is this possible? Neuroplasticity is the study of our thankfully plastic brains. Here’s the concept. When one thinks a thought, a suite of neurons fire. Repetitive thinking of the same thought results in development of a neural pathway (super highway). If one can recognize the thought and stop it (ha ha, but it IS possible) the neurons do not fire and over time atrophy and shrink, weakening the neural pathway. That is why we can change ourselves, but only through mindfulness practice. There are other benefits to releasing facial tension besides a softer relaxed facial expression. Less facial tension probably reduces headaches. Science has shown that tense facial muscles result in increased emotional tension. Similarly, scientists now know that the act of smiling produces happy biochemistry in the brain. I furrow my brow when I write or think about almost anything. This pattern of behavior is entrenched in my neural pathways. It’s time to make a change. I furrowed my brow while I typed this! I have a long way to go. I now know that relaxing facial muscles feels good. I am reinvigorating my facial exercise program, which has been a little lax. I primarily use Flex Effect, which uses resistance training, a method that can increase the size of the muscles. Facial muscles are teeny tiny, but they do respond over time. Think of strengthening one’s scalp to lift the forehead. Tom Hagerty developed circulation promoting, hair preserving, forehead lifting exercises and has maintained his hair and scalp health. Check out his tight forehead. I use the Index Knobber II to help break my furrowed brow habit during (ha ha) deep thinking at work. I keep this tool nearby and rub my forehead muscles smooth throughout the day to relax my forehead. This great little tool is easy to hold and may be used to apply deep sustained pressure on targeted muscles. I use the FaceBlaster to release facial fascia. It’s handy and I like it. I use it as directed on warm oiled skin. I rub the FaceBlaster across my forehead and I can feel the indentations in the muscles and fascia become shallower with time. I am slowly removing the deep ridges and let me tell you, it is good. The tool helps release tension, fascial adhesions, and tightness. Sanford Bennett is the epitome of body and skin remodeling. After being ill at 50, bed ridden in poor health, and wrinkled, as he wrote, he devised and devoted himself to a series of bed exercises and was deemed the man who grew young at 70, based on medical examinations. His face had become smooth and without a single wrinkle. Sanford’s wrinkle rubout consists of contracting the muscle while vigorously rubbing it as it heats up. Afterwards the muscle contraction is released and the muscle is smoothed and massaged. I use this technique with my fingers, the Index Knobber II or the FaceBlaster. Trigger point therapy helps to release muscle tension, allowing for proper circulation and muscle function. Breaking muscle tension habits are challenging. Physically releasing the tension is an important aspect of the routine. I’ve upped my Frownie use during this time. These are awesome. Unfortunately, their price recently increased. Frownies hold the muscle in place as you sleep (or as you are teleworking) to help stop unconsciousness muscle contractions. There are a variety of ways to remodel the skin. I am focusing on using the Tripolar STOP a radiofrequency devise and the Derminator a mechanical dermaroller. I am also using facial skin massage and facial skin and bone rejuvenation techniques from Flex Effect, these are very powerful practices. The daily products that I use are summarized in the February article. They contain active ingredients that promote collagen production. These practices will strengthen the skin and prevent bone loss in the forehead. With any skin treatment routine, it is vital not to over-aggravate the skin. Be mindful of the skin’s response to any treatment and give it time to rest. I allow my skin to approach irritation then I stop and give it a nourishing break. Over irritated skin results in a lack of balance and should be prevented, always. 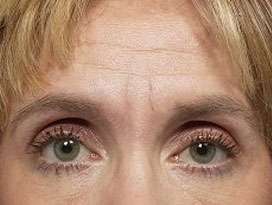 It is clear that my forehead skin wrinkles reflect the terrain below, the fascia and muscles. It is absolutely necessary to smooth deeper tissue to smooth facial skin. Overall, this effort is a fairly small time investment. I’ve changed a few daily habits and added short treatments for my forehead. · I notice other folks smooth brows. Is it botox or are their brows naturally smooth? I asked a natural beauty lady friend and she said no botox. · I emulate my natural beauty lady friend’s brow, it’s a serene experience. · My body and brain have learned that I do not want to furrow my brow. Now when I forget and furrow, the area becomes red. This never happened before. It is probably a little sensitive. · At these times, I practice full release of all head muscles. Try it. · My muscles have become substantially smoother. In the past, when I used a facial tool, the device would preferentially drop into muscle dents and now the devices move more smoothly across my skin as the muscle dents become shallower. · My skin became thicker in the spot between my brows where I use the Index Knobber. This is similar to developing calluses, thicker skin, when learning to play the guitar. It’s the same process. I am developing a forehead callus. Ha ha, that’s funny. · For more even results, I began using the Index Knobber on my entire forehead. Should take another month to thicken up the rest of the forehead skin. · I don’t mind growing my bangs out anymore. In fact, I don’t know why I had bangs my whole life. I am embracing full-face exposure. · The more smooth my brow, the tighter my forehead. I did not research this and gosh this article is so long already. My theory is that when the muscle is constantly flexed it becomes lax and when the muscle is relaxed it tightens up! · This is more than skin deep. The release of facial muscle tension can be life changing. We have more power over ourselves than we may realize. If you have a desire to do so, embrace your power to naturally change yourself in whatever way your heart calls out to you to do.